DataCollection brings it all together. DataCollection is a barcode data collection application, available for both Windows Mobile and iOS. When paired with the functionality of Microsoft Dynamics GP, DataCollection allows users to receive purchase orders while generating the subsequent receipt in Dynamics GP, automatically print paperwork, forward and order using customized workflows, and more, all in one application. Learn more about SalesPad Desktop's powerful barcoding add-on, DataCollection. Download the fact sheet to learn how you and your employees can execute daily inventory transactions with complete mobility. 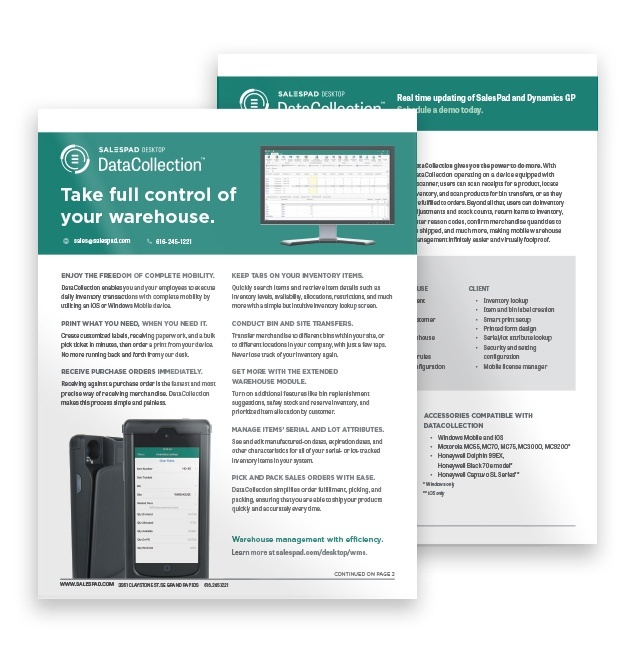 Get your copy of the fact sheet now and see how DataCollection can help your business.